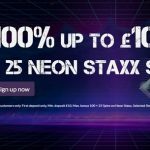 Nektan is back again with another exciting new UK online casino. The name of the new casino brand is 333 Casino and it has plenty of great games and offers, delivering triple the fun! 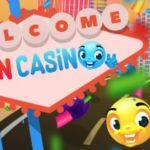 The first thing you’ll notice about this newly released dynamic online and mobile casino is that it has a wide selection of casino games that are sure to delight any newbie or seasoned player. Jackpots, the latest slots, classic virtual casino game and live dealer tables are all waiting to be enjoyed. You’ll find games from Microgaming, Evolution, IGT and, of course, exclusive games from Nektan. 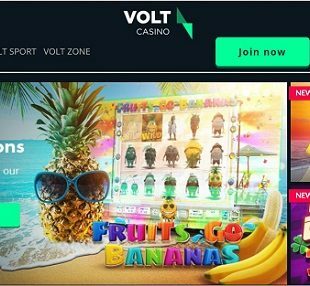 Plenty of impressive promotions are also up for grabs starting with a juicy welcome offer and continuing with a variety of ongoing offers and the chance to enjoy a VIP club. 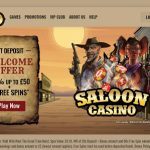 333casino.com is licensed and regulated by the UKGC, adheres to responsible gambling practices, and offers friendly and professional support, including live chat. New to 333? Lucky you! 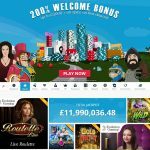 There is a giant welcome package that you can claim if you want to take your bankroll further when you first sign up. 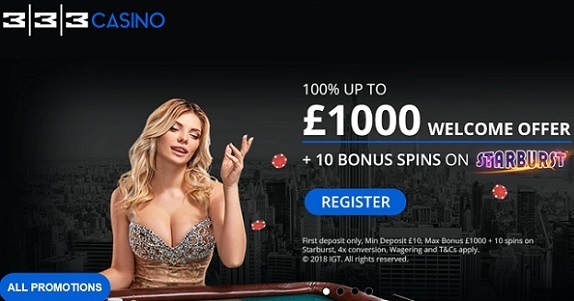 On your first deposit you can take advantage of a 100% match bonus up to £1,000. Plus, you’ll also get 10 Bonus Spins on Starburst. 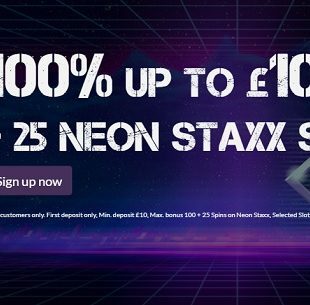 The minimum deposit amount to claim this welcome offer is £10 and the bonus funds are attached to 30x wagering requirements. Be sure to read all bonus terms and conditions for complete details. 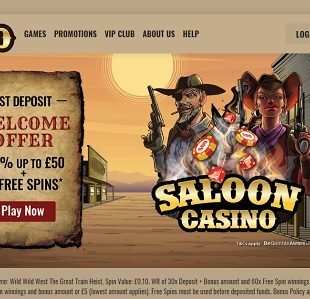 Other great offers at 333 Casino include Free Spins Frenzy, a 15% Win Boost every Wednesday, and Booster Bonus matches. What’s more, you have the chance to become a VIP to enjoy even more rewards and perks. VIP status is not automatic. You will need to meet certain conditions to be considered for this loyalty program. 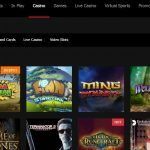 There’s a huge range of game providers at 333 Casino. 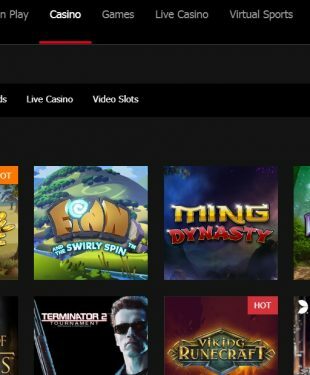 You’ll find a slew of brilliant titles form big name brands like Microgaming, Evolution, NetEnt, Blueprint, Scientific, BigTimeGaming, Realistic Games, Red Tiger, Core Gaming, ELK Gaming, Extreme Live Gaming, NYX Gaming, Yggdrasil, Nektan and more. There are hundreds of casino games for both online and mobile (iOS and Android) play. 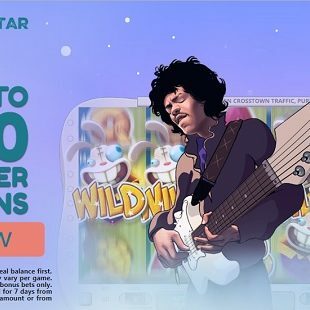 Take your pick of popular slots like Jungle Books, Starburst, Immortal Romance, Thunderstruck II, Vikings Go Wild, Wild Scarabs and more, as well as great jackpots games like Mega Moolah and Major Millions. 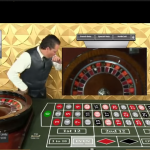 Multiple variants of blackjack and roulette are among your virtual card and table game options, while the live casino includes exciting live action games like live Auto Roulette, Baccarat Squeeze, Three Card Poker, Blackjack Platinum VIP, Dream Catcher and many more. Ready to play? Check out 333 Casino today!